Clevite rod bearings come in a wide assortment of styles for a huge range of vehicles, from mild to wild. Theyre made to meet or exceed OEM standards for strength and durability, and will help give your engine extra life. Their quality construction and superior materials protect vital parts from the harmful effects of friction. Plus, there are thousands of applications, with subtle differences that cover numerous variations and usages. So youre sure to find the bearings you need for your engine. These are not to be confused with the standard passenger car and light truck parts for the same retention applications which also have a P suffix letter. These high performance parts have unique core part numbers different from the standard parts for the same application. P-Series parts are the oldest series of Clevite high performance bearings. The rod bearings in this series typically have the greatest amount of eccentricity. Most rod bearings are available either with or without dowel holes for use in aluminum rods. Most P-Series main sets are full grooved to maximize oil flow to the rod bearings. Both rods and mains have high crush for maximum retention, and a reduced overlay thickness to prevent overlay fatigue, sometimes referred to as hen tracking. Rod bearings use a hardened steel back for added strength and resistance to fretting. 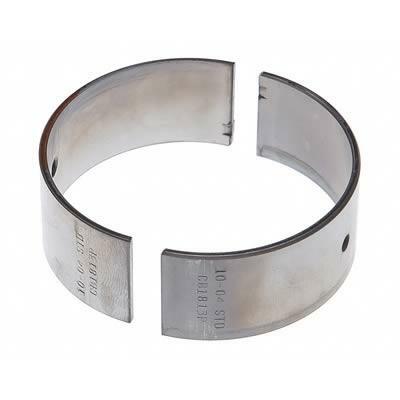 Extra clearance rod bearings are available for .001 additional clearance and select fitting. Use the P-Series rods where extremely high RPMs cause severe rod bore close-in. This is typically indicated by nearly full parting line to parting line shaft contact with bearings having less eccentricity. Use P-Series mains where higher eccentricity is desired to narrow bearing contact patterns and to provide increased oiling to rod earings. Rod bearing oil starvation is typically indicated by polishing and smearing of the bearing surface, possibly accompanied by discoloration predominantly concentrated at the axial center of the bearings. H-Series bearings have a medium level of eccentricity, high crush, and rod bearings have a hardened steel back and thin overlay. These bearings also have enlarged chamfers for greater crankshaft fillet clearance and are made without flash plating for better seating. Bearings with .001 extra clearance are available for standard size shafts and carry the suffix HX (X = extra clearance). Rod bearings are available with or without dowel holes (HD = with, H = without), main bearings are available with standard 180 degrees upper half grooving and with full 360 degrees grooving (H = 180 degrees, HG 360 degrees). Use H-Series bearings with crankshafts that have oversize fillets and where engines run in the medium to high RPM range. H-Series bearings should be used if contact patterns obtained with P-Series parts are too narrow. Contact patterns should ideally cover 2/3 to 3/4 of the bearing surface. See accompanying contact pattern diagrams. If you arent sure which type of performance bearing to start with, the H-Series bearing will be your best choice. These parts essentially duplicate the former Vandervell parts under the Clevite part numbering system. (Same core part no. as standard passenger car parts but with a suffix letter V). V-Series rod bearings typically have low to medium eccentricity and a hardened steel back. All V-Series main sets use a single piece thrust bearing rather than the former Vandervell assembled type of construction. V-Series parts are not available with oversize chamfers. Extra clearance parts are available with a suffix VX (.001 extra clearance), and VXX (.002 extra clearance) for some applications. V-Series bearings do not have flash plating on the steel back. Narrowed parts are available with a VN suffix for some applications. These are made to accommodate increased crankshaft fillet clearance. Clevite Micro bearings make up the M-Series. These are special purpose bearings having a nominal .006 thick babbitt lining on a hardened steel back. M-Series rod bearings have been slightly narrowed at one end to provide extra fillet clearance without the need of a large chamfer. The lower rod shells have a dowel hole for use in aluminum rods with dowel pins. M-Series mains have enlarged chamfers and, for certain applications, oil holes and oil grooves have also been enlarged. Ample supply of parts and very competitive prices. Reasonably quick order processing.